IF YOU know how to “talk to computers,” chances are you’ve got it made. If you don’t, you may be missing out on a great job opportunity. People who talk to computers are called programmers. They instruct data-processing machines on how to perform specific jobs. Today there are about 40,000 of these specialists at work. In six years, experts say, 500,000 more will be needed. Many will require a bachelor’s, master’s, or even doctor’s degree. But close to 50 percent will move into this new profession with only high-school diplomas. Here’s why there’s such a tremendous demand for programmers. Computers are really very stupid multimillion-dollar collections of wires and transistors. Plug one in and it does nothing. Yell at it, curse, kick it-and still it remains mute. The reason: no instructions. But once people write instructions, the computer becomes a marvelous tool. It can tell the exact moment at which an astronaut should fire his retrorockets, or identify an obscure disease and prescribe a course of treatment. It can keep watch over huge inventories and write reorders when the stock gets low. Computers can prepare your paycheck, update accounts-receivable files-even print out past-due notices when you’re late in paying bills. Thousands of new computers are installed each year to do these jobs. Each one must be programed before it can start processing. This means anywhere from 1 to 100 people sitting down to figure out every possible step in a particular operation. These steps are translated into machine language, punched into cards, and fed into the computer. There they are stored for use during the solution of a problem. Education is important, but most important is a quick mind, with the ability to see details. You must be able to stay with a problem until it’s solved. Where do you look for a programing job? In many cases it will look for you, especially if you work for a company with a computer setup. Experience has shown that good programmers are usually found within a company, and most firms will give their employees first crack at the job. Supposing the job doesn’t come looking far you? How can you learn programing? If you are a high-school or lower-class college student, your best bet is to complete as many mathematics courses as possible. Some secondary schools offer programming classes and data machine operation. More than 100 colleges and universities offer full-fledged programing courses. Many lead to a degree in mathematics or physical science. And while a piece of parchment isn’t essential, it does increase your value in the job market. â€¢ Night or technical school. Technical schools advertise in most big-city newspapers. Caution: Some are more concerned with collecting tuition than providing instruction. Contact the local office of a national data-processing film and find out which schools they recommend. Among the major computer manufacturers are IBM, Remington Rand Univac, RCA, National Cash Register, Burroughs, Control Data, and Honeywell. Some offer their own courses. They will also supply you with literature about programing. Home-study courses are really helpful. A recent experiment by a large industrial firm showed that programmers who had successfully completed a home-study course did as well-if not better-than those who attended classes. Possibly the most successful of these courses was designed jointly by Pennsylvania State University and IBM. The first step in programing is to reduce the problem to its simplest terms. Let’s take the task of multiplying two numbers together, adding a third to the product, and displaying the sum. In other words: the equation d=ab+c, which might be part of a bank program for calculating compound interest. To get the machine to perform this routine, the programmer will first have to write instructions in machine language that will cause a, b, and c to be read-in from an input device. Usually this device will be either a magnetic-tape unit or a punched-card reader. Thus, the programmer will tell the computer which input device to go to, how to identify the input numbers, how to bring them into the main processing unit, and where to store them once they are in. Next, number a must be transferred from the memory unit to a section called the multiplier register. Then b must be moved in and multiplied by a. After that c must be moved in and added to the product to form d. Finally, d must be moved to an output device-such as a high-speed line printer-where it is written out in a previously specified format. Each of these steps will have to be analyzed, written out in flow-chart form, corrected, polished into block-diagram form and finally translated into computer codes. What can you earn as a programmer? The average for a beginning or lowest-level programmer is about $110 a week -although some firms pay as high as $170. A senior programmer commands an average $150; a lead programmer about $160; and a supervisor about $190. There is also excellent advancement. It is not unusual to hear of a manager of data processing being made a vice-president of his company. 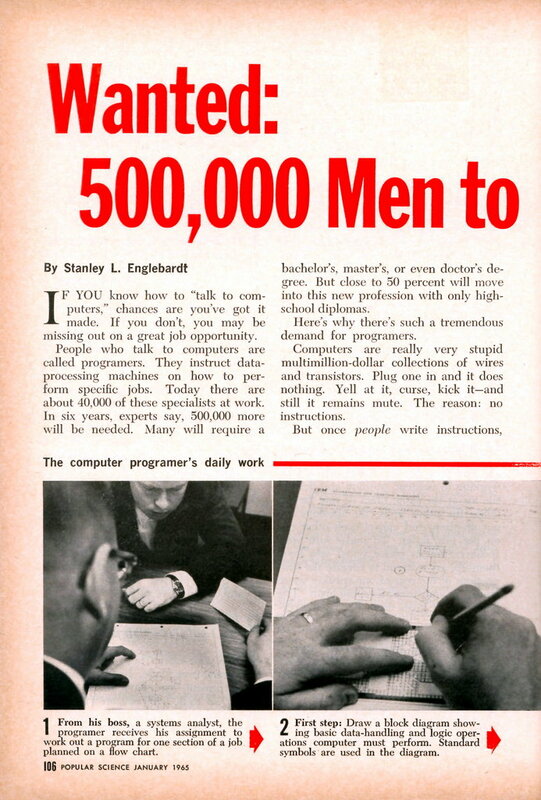 And while managing a large-scale computer installation involves considerably more than just instruction writing, each of these men either started or served a term as a programmer. From his boss, a systems analyst, the t programmer receives his assignment to work out a program for one section of a job planned on a flow chart. First step: Draw a block diagram showing basic data-handling and logic operations computer must perform. Standard symbols’ are used in the diagram. Consulting a special dictionary, programmer spells out instructions in a “programing language” -a code describing standard sequences of machine operations. 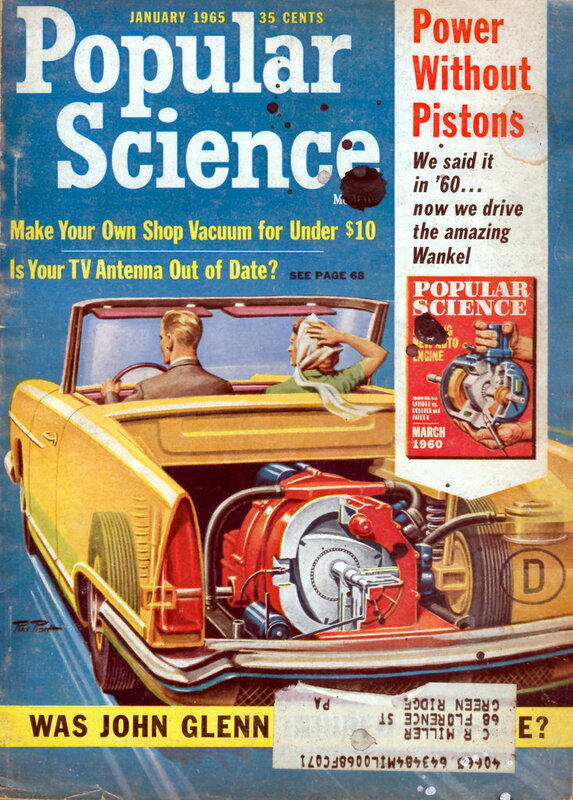 Coded instructions, now punched into t cards, are fed into a computer, which automatically translates steps into precise instructions it can follow. Program is tested to see if it processes t the data correctly. Programmer can check its progress by reading numbers on the computer’s control console. Programmer finally studies results printed out by the computer. The job of a programmer was demonstrated in these photos by IBM systems engineer R. Reuel Stanley. Could you answer these test questions? Sample these questions given to applicants for computer-programmer training by Honeywell Inc. for a hint as to whether you have the aptitude to be an electronic brain feeder. An electronic-parts distributor has some transformers in one of his stockrooms. They all look alike but he knows that a mistake has been made and that there are two types of transformers (types A & B) in the room, and that there are four of each type for a total of eight. He receives a rush orderfrom a customer for either two type-A transformers, or two type-B transformers. The customer has the equipment to tell the difference between the transformers, but the parts distributor does not. Since the transformers are very expensive to ship, the distributor ships the minimum number necessary. How many does he ship? If the statement, “There are more dogs in the U.S. than there are hairs on any one dog in the U.S.,” is true, then is the statement, “There are at least two dogs in the U.S. with exactly the same number of hairs,” true or false? And why? If a brick balances evenly with three quarters of a pound weight plus three quarters of a brick, what is the weight of the whole brick? A light flashes once every five minutes; another light flashes once every 14 minutes. If they both flash together at 1 :00 p.m., what time will they next flash together? Alice is as old as Betty and Christine together. Last year Betty was twice as old as Christine. Two years hence Alice will be twice as old as Christine. Their ages? A man and his wife live on the fifth floor of an apartment building and have no phone. Frequently, when he comes home from work at night, his wife asks him to run an errand before dinner, but of course not the same errand every night. So, in order to save himself a trip up the stairs every evening, she puts a light in each of the four windows that can be viewed from the street. What is the most number of errand messages his wife can choose from, at anyone time? “People who talk to computers are called programers” – oh no they’re not! I think more people should recognize Stanley Englebardt as a true visionary in the field of computers. He also took time to write about children with disabilities ( as published in Reader’s Digest). What a neat guy.